As a family we’ve been in transition for more than two years now. I often wonder when I’ll stop saying we’re in transition. . . and then I wonder, are we always in transition from something to something, or from somewhere to somewhere? Life is not static, but when things feel unsettled and uprooted, it spurs the desire within me to find order and control and predictability. Although we moved into our new house in February, there is still so much around us that’s undone. I am one of those people that gets into a new place and immediately unpacks and arranges and makes it feel like home. (Yes, I even do this on a small scale in hotel rooms—it’s my way of creating home for myself and my family I guess.) But in our new house I haven’t been able to create home to the extent I would like. We have a few rooms finished, but many, many things are still half-done or completely undone. That’s hard for this pictures-up-on-the-wall-by-day-two sorta girl who’s generally quick to settle into new environments. In addition to moving, we are also renovating and starting up a new inner city missions community in the heart of Sydney. We’ve taken over a glorious old nine bedroom boarding house (yes, for real) and room by room we’re preparing it for ourselves, our guests, and those we’ll invite into our ministry and community. Our house is filled with (wonderful!) donations and we have been moving them from packed out room to packed out room as we work on fixing floors and scraping and sanding and painting and fixing things one room at a time. It’s organized chaos at the best of times, and just plain old chaos at others. My family is healthy and growing, my pregnancy has hit 25 weeks without a hitch (a Big Freaking Deal after three consecutive miscarriages), and God has opened doors for us in the city and with ministry and work and writing that we could have never opened on our own. I even have a little room on the second floor with a window overlooking the neighborhood where I can steal away to write—something I’ve always dreamed of. Life is good and I am grateful. But even with all of that, settling into our not-tiny house has made me miss the simplicity and order and completeness of the little caravan we lived in on and off during all of last year. Although it was small, it was “finished” and set up to our liking and everything had a place and a purpose. In our current home we could fit our caravan into our kitchen. (We have never been more thankful for a place to stretch our legs!) Of course we are loving our new-found space, but we are also tripping over the same stack of suitcases that have been in our hallway now for three months because we have no garage (welcome to city living!) or closet big enough to store them—a ridiculous problem in a house with so many rooms and yet only two closets and a pantry. As crazy as it’s been, it’s our crazy and I’m going to own it as best as I can. I’m also searching for how to simplify in this new season. Simple living does not equate to minimalist living for the majority of people, including me (though if that makes your life simpler then by all means, go for it). 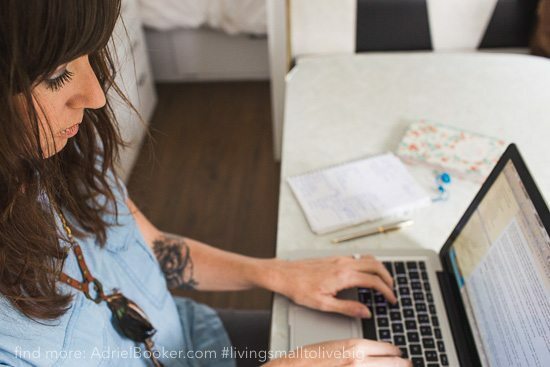 As my friend Tsh reminds me through her life and her writing, simple living is not as much about the stuff or the space, but about the mindset and the approach—the intentionality. And that’s what I’m trying to find as I unpack boxes that have been stored for more than two years—what does intentional living look like in this season, in this environment. If I’m honest, I feel like I’m getting it all wrong. That’s probably not true at all; it’s probably more a case of me adjusting to a new version of intentionality. Part of that intentionality is picking up my (figurative) pen again. I’ve pushed writing aside for months justifying that it’s too far down the priority list (and have, instead, let myself be ruled by the Tyranny of the Urgent—ugh). Because of that I’ve let an important part of me melt away into a barely recognizable puddle. Have you ever tried to scoop up a puddle? It’s cumbersome and messy and that’s exactly how I feel right now. Writing is not coming easily, but I have to resist the resistance (thanks Steven Pressfield) and do it anyway, if for no one’s sake but my own. So I guess this is my little way of saying I’m back. Though I don’t know exactly what it will look like, I’m picking up blogging again. I find when I’m blogging regularly, my offline writing flourishes too. I think it has something to do with discipline and practice and moving into a creative flow. Maybe there’s also a sense of accountability to something outside of my little hard drive. So although I won’t promise sweeping essays to make you think deeply or poetic prose to make you cry with nostalgia or longing, I do promise here (publicly!) that I’m writing again and this space will hold some of those words. The internet is a fickle place and people don’t always stick around when you take an announced or unannounced (intentional or unintentional) leave of absence, but I’m grateful for you who keep showing up anyway. Somehow, you make the work sweeter so thank you. I’m finding my new normal—my new intentional—in my gigantic, run down old home in the most wonderful neighborhood in the world surrounded by a house full of noisy, energetic boys and half-done renovation projects. And that? It’s good. All of it is good. How about you? What’s stood in the way, or enabled you, in your intentional living lately? I loved reading about your tiny house life when I first started reading your blog, and I look forward to hearing about your big house life. Love to read your thoughts whenever you feel like sharing. So glad to see you here again! Our lives are always in transition it is true… Because if it wasn’t we would be stagnet. Sounds like you have a whole lot of promise out there waiting for you. Hooray for 25+ weeks! Anyway, I’m excited to read about your life! This city ministry sounds awesome! Adriel;, your voice certainly has been a (little) quieter, but thanks to Booker Newsletters and so on, I’ve felt like I’m in the loop (somewhat) with what’s been going on. That being said,when you see the words in print “two years in transition” would be cause for lunacy in anyone’s book. Add to that your challenging, emotional pregnancy and the fact that, oh yeah, you’re starting a ministry in the inner city….well, no wonder writing (blogging) has been set aside. For good reason. I for one knew you were there–we just couldn’t see you or hear you. Kind of like a light bulb that’s waiting to light up a dark room (although you can’t hear light bulbs, so there goes my metaphor). Anyway–you will be in my prayers–your life and Ryan’s are a testimony to God’s faithfulness and goodness, as well as being an inspiration. Nice to see you back!!! I find that when the breaks are spirit led, it’s as if the words never stopped flowing. God’s version of time and space is so good like that. I’m thankful for your words friend. A new kind of intentionality…yes, I’m searching for it too. We tend to think intentionality should look similar for all. But I’m learning targeted living varies depending on so many factors that we only realize as we wrestle with our unique circumstances and stories. Praying for you as he releases you into this new version of your God-led lifestyle. Glad you’re getting back to blogging. I know how hard it can be with a pregnancy but you sure can pull it through. I look forward to reading from you in the days ahead. Your post on 100 little things about pregnancy and being a fist-time mom is huge. I appreciate it. Thanks for writing this. It felt very real and its easy to relate to as my life for the past three years has been all sorts of crazy. You are not awkward in writing, it comes across as heartfelt. Sending you all my love and support from several continents away.